Information for Black Mesa, Oklahoma's highest point at 4,973 feet. Highpointers Club members frequent this trail. 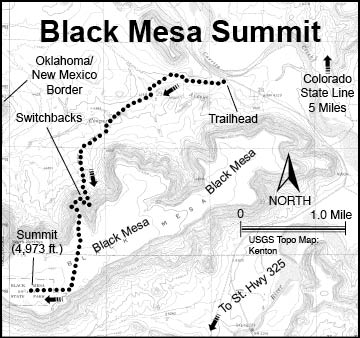 Maps, photos and accommodations for Black Mesa found here. The highest point in Oklahoma at 4,973 feet, Black Mesa Summit can be reached with a scenic 4.2-mile hike across landscape unknown in other parts of the Sooner State. Frequently hiked by members of the national HIGHPOINTERS CLUB, it's a great trek for anyone looking for an outdoor adventure. Here at the northwestern tip of the Oklahoma Panhandle, short-grass prairie meets the foothills of the Rocky Mountains. Rugged cholla cactus, juniper, and scrub oak dot the area’s rocky buttes and mesas. Some 600 feet above the surrounding terrain, the entire Black Mesa geological formation extends north and west from the tip of the Panhandle 40 miles or more into New Mexico and Colorado. TRAIL LENGTH: 8.4 miles round-trip. DIFFICULTY RATING: Moderately strenuous. SPECIAL NOTE: No water available and poisonous rattlesnakes and copperheads frequent this area from mid-spring through early fall. TRAIL MAP AND NARRATIVE: The well-marked trailhead has several signs with descriptive information on the summit trail and the area’s flora and fauna. A rutted jeep trail proceeds west from the trailhead, with Black Mesa to the southwest. The trail stays relatively flat for the first couple of miles. As the trail meanders west-southwest, the small buttes to the north and the mesa to the south provide great views. After less than a mile you can see a railroad car in the distance to the west. The first trail marker soon comes into view: a green metal arrow pointing the way. The third trail marker informs hikers that the summit lies 2.6 miles ahead. The trail makes a sharp turn to the south at 2.2 miles from the summit, and you can faintly see the trail ahead winding up a projection of Black Mesa. The footing becomes a bit sportier along this rocky stretch, followed by the 600-foot ascent along the switchbacks. The climbing gets steep as another trail marker announces the summit 1.8 miles ahead. While still ascending and a little more than a mile from the finish, you encounter a barbed-wire fence and overhead wire. 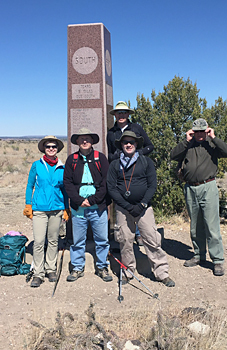 This marks the end of the ascent and the start of the approximately one-mile panoramic walk atop Black Mesa to the summit marker. The trail proceeds generally to the south-southeast and then bends to the west. Several yellow signs guide the way. About a quarter-mile from the finish a granite obelisk comes into view, jutting up from the surrounding flat terrain. New Mexico lies a few hundred yards west of this marker, and a small mountain rises far on the western horizon. Less than five miles to the north, you can see rugged terrain and mountains in southeast Colorado. 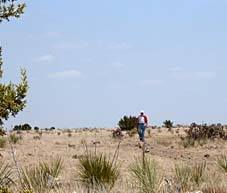 ACCOMMODATIONS: Black Mesa lies in the most remote area of the state. The nearby town of Kenton, OK, (population 17) has lost its only store, the once-notable Kenton Mercantile. So no gasoline or supplies can be purchased in the area. A few bed-and-breakfasts and cabins are available for overnight stays within a few miles of Black Mesa. The Hoot Owl Ranch (1-580-261-7789) offers two cabins for rent and evening meals to the public by reservation only and only on Friday and Saturday evenings. 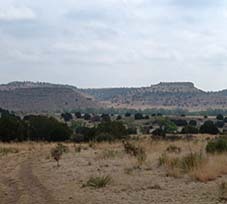 Black Mesa State Park, approximately 14 miles south of the trailhead for Black Mesa Summit, has campsites and RV hookups. Gasoline, supplies and a number of restaurants and motels are available in Boise City, OK (37 miles east) and in Clayton, NM (47 miles south-southwest). A polished-granite obelisk marks Oklahoma's highpoint, which provides a view of New Mexico peaks to the west. The granite marker was placed at this location in the 1950s. This scenic state highpoint is in Cimarron County, the only county in the United States that borders four states: Colorado, Kansas, New Mexico, and Texas. A jeep road leads to Black Mesa Summit to the southwest of the trailhead. 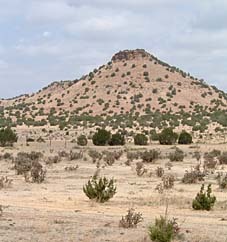 Spindletop buttes lie to the north of Black Mesa. The final approach to the summit is flat and guarded by a variety of cacti.